The most technical woman requires the most technical gear to amplify her lifestyle. Whether on the slopes, or in powdered back-country on a snowmobile, Klim seeks to provide a singular answer with the Women's Alpine Parka. This advanced outer shell is made for the most demanding conditions, which is why Klim uses nothing but the best materials. The Klim Alpine Parka uses Gore-Tex Performance shell technology, which is guaranteed to keep you dry. This durable layer is backed with a 500D Cordura chassis, which is interrupted only for ventilation purposes at the arm pits, chest, and back. A snow dust barrier lives at the waist line on this inside of this Jacket to keep powder from creeping up the inside if you take a tumble. Storm flaps under all the major zippers (which are also water resistant, themselves) also strengthen the Alpine's resolve against snow. Of course, the Klim Alpine Bib comes with reflecting features, overlapping the Parka in its fitment to give the best chance of success against the elements. 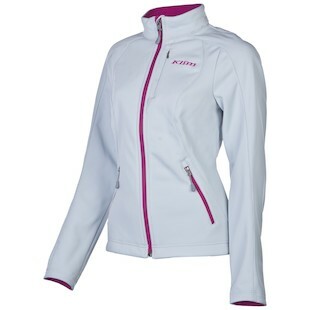 As Klim aptly puts it, this is the combo for "the real female rider who stops less and rides more." Here is the catch. Using insulation only at the neck, these shells are kept Thinsulate free for a reason. An active user will generate a sweat and keep their body temperature high, canceling out the need for substantial insulation. However, if you are the type to push it further into the cold, Klim gives you the option of layering with these three choice mid-layer options. Starting simple, the Klim Sundance Jacket is merely a stretch fleece, though the details on this beauty are anything but merely simple. Flat lock stitching, detailed zipper pulls, an embroidered collar, and classic color blocking are only a few of the tidbits that will stand out on the Sundance. Wearing it under the Alpine Parka adds warmth and provides a basic level of protection against the cold. 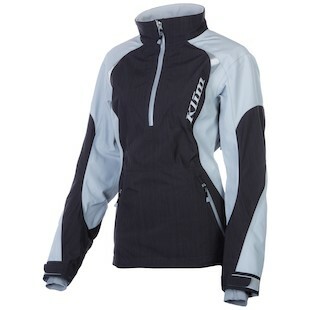 Stepping up to the Klim Whistler Jacket, you'll find a shell made from Gore Windstopper. This material is 100% wind-proof and nearly waterproof, though technically classified as "water resistant." Its highly breathable as all Gore products are and will dramatically reduce any windchill that makes it through your Alpine Parka. My wife actually wears the previous version of this jacket for street use and remains quite toasty even when riding pillion in the 30s and 40s with me on my motorcycle. New colors, added comfort and style details and a refined female-specific fit make this an upgrade from years past. On to the most aggressive option, the Klim Cascade Pullover provides another complete layer of Gore-Tex to the Alpine Parka. Providing just as much wind resistance as the Whistler, but a waterproof guarantee, you are maximizing the benefit by layering Gore products together for warmth, dryness, and insulation. A sporty articulation throughout the form ensures that your mid-layer will move with you and your shell with every stroke. When you arrive to your at the focus of your journey, the Cascade will easily act as a destination layer and is even complete with its own reflective strips for visibility. To be fair, the Cascade has enough credentials to be used on its own in more casual conditions. 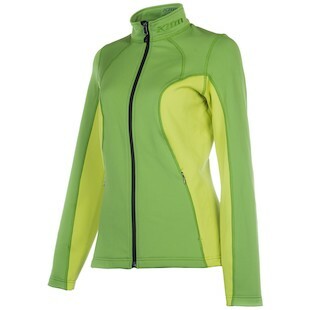 If you are just a bunny-slopes gal, the Cascade Pullover would likely be sufficient to get you through the day. However, it is thin enough to fit under a shell like the Alpine Parka, so it is flexible in this regard. Staying warm and dry may seem like a creature comfort, but those who brave the snow in serious conditions know that this is a necessity for safety and longevity out on the mountain, or back in those snow-covered hills. Don't get caught out in the cold! Layer up, then lay it up this winter.